5M335 BANFLEX (POLYFLEX) Polyurethane Light Duty V-Belt. 5M Section. Top Width 3/16” (5mm). Length 13.2” (335mm). 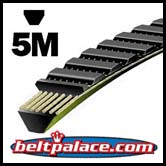 Home > METRIC V-BELTS > 5M POLYFLEX (BANFLEX) METRIC V-BELTS > 5M335 BANFLEX (POLYFLEX) Polyurethane Light Duty V-Belt. 5M Section. Top Width 3/16” (5mm). Length 13.2” (335mm). 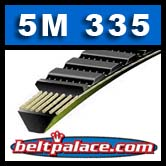 5M335 BANFLEX (POLYFLEX) Polyurethane Light Duty V-Belt. 5M335 BANFLEX (POLYFLEX) Polyurethane Light Duty V-Belt. 5M Section. Top Width 3/16” (5mm). Length 13.2” (335mm), 60 Degree Angle. Ribbed backing for lateral stability. Resists fatigue, wear, ozone, and most environmental conditions. Temp. Range: -65°F to +180°F (-54°C to +85°C).